Throughout human history we have transformed our food system on several notable occasions. The ability to domesticate plants and animals, for example, brought about the first transformation: the rise of agriculture. The food system we know today is the result of the “green revolution” of the mid 20th century. 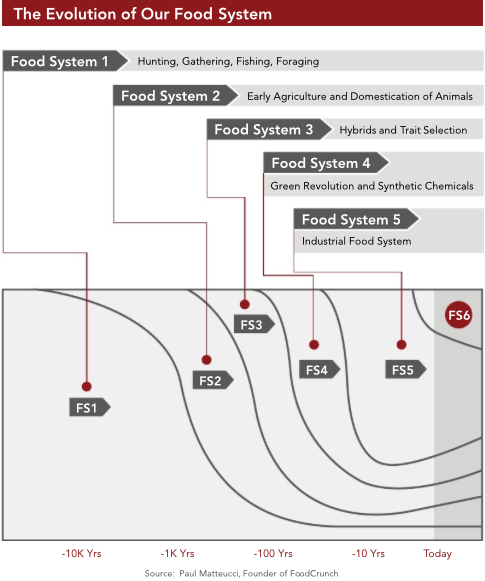 Transformations of the food system illustrated by the team at Food System 6. The green revolution of the mid to late 20th century solved for quantity. How can we grow the most calories possible to feed a growing population? The key pillars of this revolution were 1) innovations in chemistry to create artificial fertilizers, herbicides, and pesticides; 2)the development of high yielding grain crops; and 3) controlled water infrastructure (e.g., irrigation). The result: we massively increased the quantity of food we produce as measured by crop yields. Alas, as with most things, there are unintended consequences. We made a food system that produces the wrong food with massive damage to the environment. This is why we are at the beginning of the next transformation in our food system. This time, while preserving our ability to produce quantity, we are solving for sustainability. The three pillars of our next food system are 1) biodiversity, 2) new food crops, and 3) digitization. With today’s industrial food system, millions and millions of acres of land are dedicated to growing a single crop at a time, and a lot of effort and chemicals are devoted to keeping everything else out. Over time, monocropping degrades the land and leads to weeds and pests resistant to the chemicals. In stark contrast, thriving, healthy ecosystems in nature contains masses of biodiversity. From the deepest forest to the bottom of the ocean to the highest mountain top, natural ecosystems contain hundreds or thousands of species of plants, animals, and microbials that are all interconnected. Our next food system mimics nature: growing food in an ecosystem that incorporates plant, animal, fungi, microbial, and yet to be discovered participants. 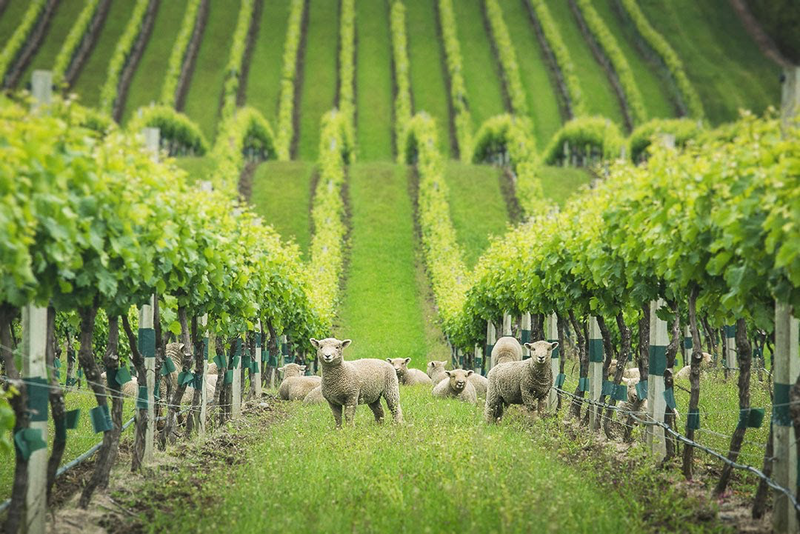 Today, the land that produces the grapes in your glass of wine only produces wine grapes. In our next food system that land will also produce the grains in your bread, the milk in your cheese, the wool in your sweater, and the lamb on your dinner plate. The ranch that produces your beef will also contain chickens and swine and grow your turnips, kale, and beets because the swine eat that too. Nothing is wasted. Some current food crops will also be grown indoors. This form of indoor farming is more akin to a factory than a farm: highly automated, highly data driven. Why should 90% of North America’s leafy greens be grown in California when 75% of the population live east of the Rocky Mountains? Highly perishable products like leafy greens, strawberries, broccoli, etc. travel, on average, in excess of 2,000 miles (3,200 km) from farm to fork. 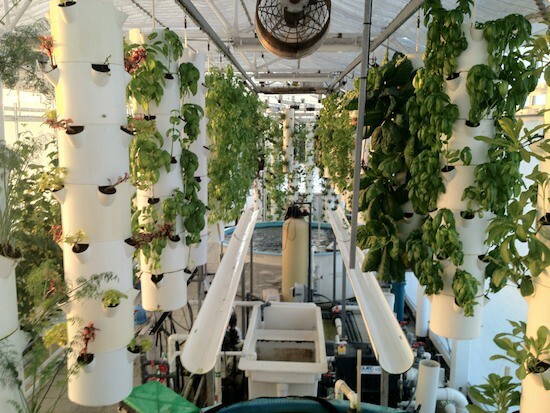 Moving them out of the soil and into hydroponic facilities close to population centers means you can grow nutrient dense, fresh produce, using 90% less water, harvest daily and year round, create less food waste, and grow nearer to major population centers. This applies to fresh fish and seafood because there is a symbiosis with the waste products of fish and the nutrients needed by the produce. It’s another form of biodiverse ecosystem. The major grains that feed the world and its livestock— corn, wheat, rice, soy, etc. — are annual plants. Annuals seed, bloom, and die each year. As Neolithic humans domesticated plants for food 10,000 years ago, it was easier and faster to iterate by selective breeding on annuals. Perennials, on the other hand, did not get this kind of advancement because they are permanent. We chose annuals because they are fast when, in fact, perennials may be better: deep-rooted systems that reduce soil erosion and sequester carbon from the atmosphere. Advances in genetics and, in particular, the ability to edit genomic sequences in software — the digital equivalent of selective breeding — enable iteration on perennials more quickly. This means fields that hold more water, hold more soil, and hold more fertilizer. It makes it easier to grow grains on otherwise marginal lands. Perennial grasses also form the foundation of a biodiverse ecosystem for animals to graze and microbiome to thrive. New foods will be “discovered” in the food waste produced by our current system. As food waste becomes an ever more important topic, uses are being found for the by-products that have otherwise been thought of as waste. Ever wonder what happens to millions of pounds of soy fiber after we extract the liquid for soy milk and tofu? What about the whey after its separated from the curd used to make cheese? What happens to all of the shells from the billion pounds of shrimp consumed each year in the United States alone? All of these are usable and, often, still nutritious foods for humans and animals. 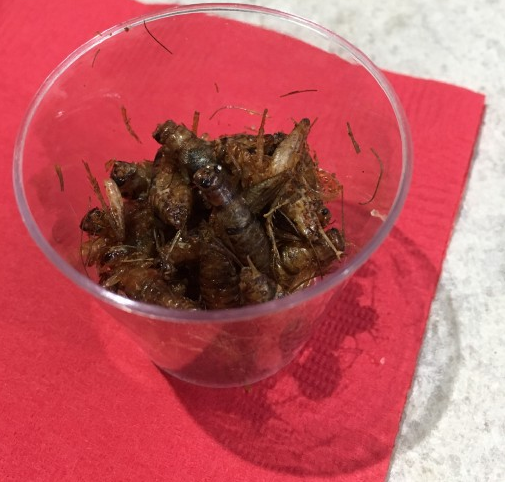 Crickets as a lean, high-protein snack from Tiny Farms. To meet the nutritional needs of a growing population we will tap into the last frontier of protein: insects. Insects far outnumber humans, reproduce quickly, and require a very small land footprint to cultivate. We will see insects enter our food supply first in animal feed and, over time, as human food products. Packaging your food will be new substances derived from plants or waste by-product of other food. This enables the packaging to be biodegradable. It won’t accumulate and toxify in the ocean as plastic does today. From leather derived from mushrooms to “plastic” synthesized from shrimp shells, this packaging returns ashes to ashes, dust to dust as organic matter back into our soils and oceans. Being biologically derived, this living packaging can express itself: your food packages will change color to let you know your food is spoiling, and your fusilli pasta will transform from a flat sheet into its characteristic corkscrew only when it is perfectly al dente. Genomic and chemical spectroscopy data will be so inexpensive and pervasive that your food will tell you what it is and the nutrients in contains. You won’t need a label. Currently, food is the least digitized supply chain of any industry. The recent proliferation of smart devices like phones, wearables, tablets, and inexpensive yet sophisticated sensors, and advances in robotics make untethered data collection and analysis as food is grown in the field and travels through the food system to your fork. No longer will decisions on the farm be made through human observation and trial and error. Decisions about how to grow food and how much to grow will be based on the measurement and analysis of biodiverse ecosystems with digital data collection, big data science, and sophisticated analytics. Digital data, stored in the cloud and easily accessible and sharable along the supply chain means a more transparent food supply with far less waste. No longer will we grow as much as we can and shove it all into the beginning of the supply chain — wasting half of it along the way. Rather, we will make sophisticated forecasts to grow exactly what is needed, when it is needed. We will waste less. Every transformation in our food system — from the rise of agriculture to industrialization — has solved a problem of the previous food system before it. The next transformation in the food system is upon us: biodiverse ecosystems of food production, new food crops, and the computational power of modern computing form the pillars. There is much reason for optimism. On a daily basis I see companies (large and small), government organizations, and non-profits that are innovating and collaborating to bring about this new food system. The three pillars I illustrate are technologies and innovations that are grounded in the present. They exist now. We need only to use them, deploy them, and grow them. It is an exciting time to work in the food system. I do wonder, though, what will be the unintended consequences? Food technology and innovation are reshaping our world. Here, we share analysis and research from our Sustainable Food Systems team. We evaluate agriculture, aquaculture, logistics, and food waste technologies to accelerate their adoption across the food system.